The road surface is dry and visibility is good. Even tight cornering poses no problems. But suddenly things turn nasty when, without any warning, you've hit loose chippings. And that spells trouble. The car starts to go out of control and rear threatens to break away. 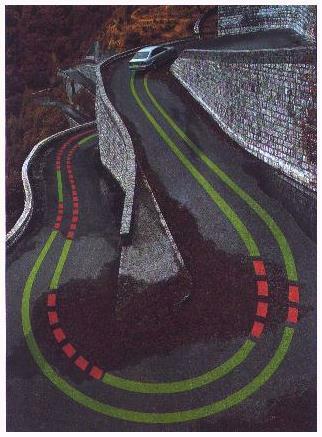 You apply brakes carefully and sensitively countersteer, keeping your eyes glued to the oncoming traffic. It is a situation that demands a whole series of perfectly coordinated reactions which only an experienced rally driver could be expected to execute flawlessly at any time. The same situation could be mastered without the least bit of effort or stress if you happened to be driving a BMW equipped with ASC+T. This stands for Automatic Stability Control plus Traction, and is a system which prevents the drive wheels from spinning, thereby ensuring that the car stays on course in all conditions. 1. 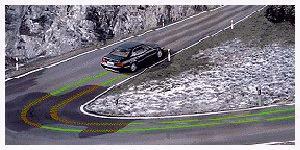 Driving stability must be guaranteed at all times, both when driving straight ahead and when cornering, and this must be independent of the accelerator position. 2. Traction in the drive wheels must be optimally utilized, specially when moving off on road surfaces with marked differences in the fractional coefficients on the left and right. 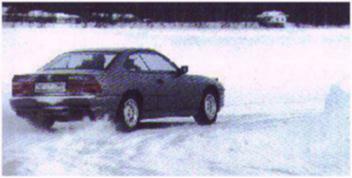 In other words, even in ice, snow and rain, and on other slippery surfaces, the power delivered to the wheels must not exceed a level that would cause any of them to spin, even if the driver has his foot down on the accelerator. It almost sounds as if ASC+T were able to defy the basic laws of physics. What actually happens is that the vehicle is kept on track at all times through a series of coordinated and electronically controlled interventions in the engine, ignition and brake systems. It works like this: in critical situations on the road, the angle of the throttle butterfly in the ignition system is altered in such away as to allow only the maximum transmissible power to reach the wheels, while Digital Motor Electronics (DME) adjust the ignition time. This results in the drive force being cut back by up to 50 per cent. In addition, ASC+T will also activate the brakes in the rear wheels if necessary, and to varying degrees if frictional coefficients on the road differ. The ASC+T system knows when stability and traction have to be increased thanks to the ABS sensors, which provide the computer with a steady stream of data on wheel slip for each side of the car, as well as on changing speeds in the drive wheels. 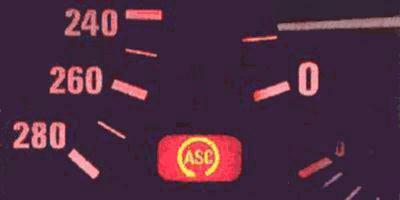 If the predetermined limits are exceeded, the control unit will instantly activate the traction system. All the driver registers of this complex procedure is a decrease in engine torque despite the fact that pressure on the gas pedal may not have changed. Also, a control lamp in the instrument display will come on to indicate that ASC+T is in action and that the driver should adapt to the altered road surface. As a certain slip in the drive wheel is necessary for optimum thrust in sand or deep snow, the ASC+T system can be switched off manually. ASC+T is available as standard equipment in all '97 BMW models with a capacity of 2.8 litres or more and as an option in all BMW four cylinder models.